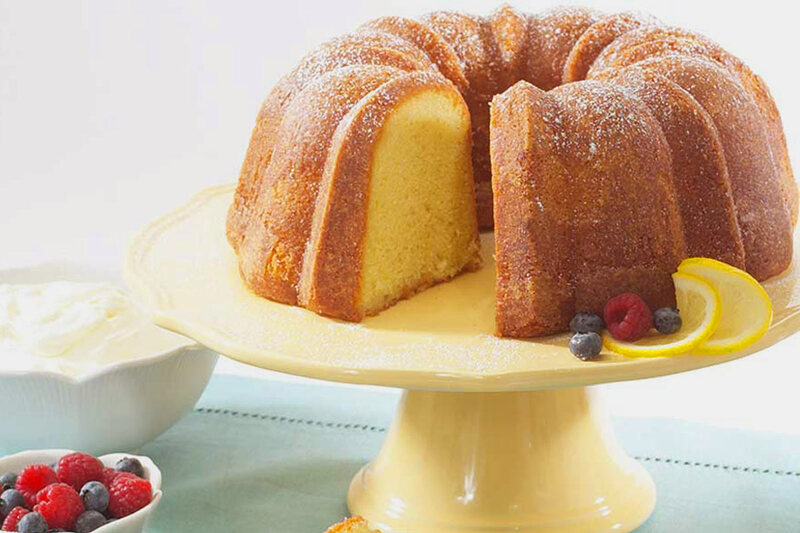 This Bundt is lemon heaven and a real tingle to your tastebuds! Try with fresh berries and mascarpone cream. Preheat oven to 170°C. Prepare your pan by using a pastry brush and melted butter, ensuring that you reach inside every crevice of the pan, then dust with flour. Alternately, use a baking spray that contains flour and brush excess with a pastry brush to evenly coat the pan. Sift together the flour, baking powder, baking soda, and salt in a large bowl. Set aside. Beat the butter and sugar on medium speed in an electric mixer, until light and fluffy – about 5 minutes. Add the vanilla and mix until combined. Add the eggs and the egg yolks, one at a time, mixing between each addition. Add the lemon zest and white chocolate. In a 1-cup measuring cup combine the buttermilk and lemoncello. Add the flour and buttermilk mixtures alternately to the butter mixture, beginning and ending with the flour. Pour the batter into the prepared Bundt pan and smooth the top. Bake for 60-75 minutes or until your Reusable Bundt Cake Thermometer indicates it is cooked (or a toothpick inserted in center of the cake comes out clean). Remove from the oven and cool in the pan on a wire rack for 20 minutes. Remove the cake from the pan and cool completely on the wire rack set over a rimmed baking sheet. Once cooled, dust the cake with confectioners’ sugar. Combine the sugar with water in a small saucepan and cook over low heat until the sugar dissolves. Remove from the heat and whisk in the lemoncello. Spoon the syrup over the warm cake. Whisk the softened mascarpone cheese with the lemon zest in a large bowl. In an electric mixer fitted with a whisk attachment, beat the cold heavy cream on medium speed while slowly adding the confectioners’ sugar until soft peaks form. Fold 1/4 of the whipped cream into the mascarpone mixture to lighten. Then fold the remaining whipped cream into the mascarpone mixture. Refrigerate until ready to serve. Combine the strawberries, blueberries and raspberries in a medium bowl. Refrigerate until ready to use. Cut a slice of cake and place on a dessert plate. Spoon some berries on the cake and top with a dollop of mascarpone cream. Garnish with a sprig of mint.